The new standard improves charging by 27% over the Quick Charge 2.0. Qualcomm's latest line of SoCs have a new charging feature, dubbed Quick Charge 3.0. The new standard, which will ship on the Snapdragon 820, 620, 618, 617, and 430 next year, promises to take a phone battery from 0 to 80 percent in about 35 minutes. Qualcomm says the new charging standard will "improve fast charging up to 27 percent or reduce power dissipation by up to 45 percent when compared to the Quick Charge 2.0." provided vendors use Qualcomm's "advanced parallel charging configurations." The new standard uses an algorithm called "Intelligent Negotiation for Optimum Voltage (INOVA)," which lets the device continually request a power level from the charger, from 3.6V to 20V, in 200mV increments. 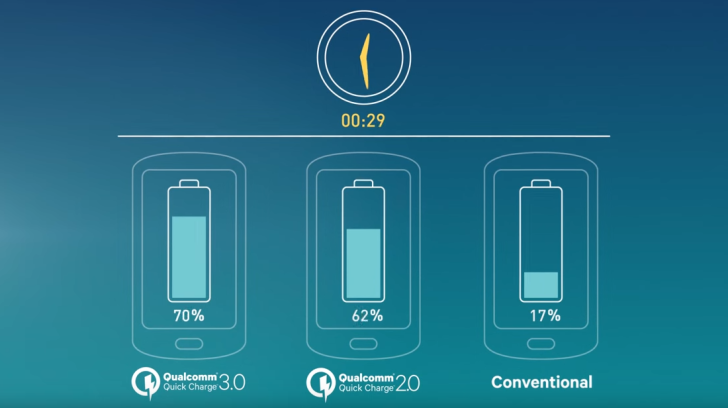 Quick Charge 2.0 only offered four charging voltages, but 3.0 offers 82 different voltage "sizes," which Qualcomm says results in "minimized losses, increased efficiency, and improved thermal performance." Quick Charge 3.0 is backward compatible with versions 1.0 and 2.0 and is connector-independent. You'll need a new phone and a new charger to take advantage of the higher speeds. Qualcomm says to expect the speedier charging standard in new phones due out next year.